"?When I started as an artist there were no manuals to teach me the basics; nothing in print or online that showed me what to do. Now that I am living my dream and working as a paid artist, I get asked, "How do you do it? How did you become an artist - and make money at it?" Answering these questions I realized I should write a manual; the book originally sought after when I started. This conclusion lead me to "think outside the frame" and fill this book with everything useful; all of the tools and information, the knowledge and inspiration to "promote yourself" and become a working? PAID? Artist! If you want to make a living doing what you love, then this book is a MUST HAVE!! Its wonderfully written, packed full of excellent advice!! Don't limit yourself because you 'think' there is no other way. Think Outside The Frame! I've implemented these ideas and it's simple, IT WORKS!! Buy it, you won't be disappointed!! If you want a fast track to becoming a successful artist, it can't get any more to the point than the information in this book! 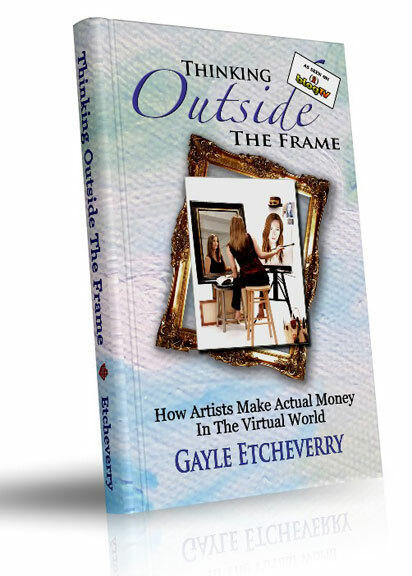 I was first introduced to Gayle's work in action on BlogTV. How she can chat and paint at the same time still baffles me. So many people were chatting to her and asking a ton of art related questions, which she would always answer with her bubbly insightful personality. So, here are all those wonderful questions answered in an easy to understand format; pinned down with hundreds of examples for the reader to employ. But, in this book she also tells us much about how challenging it was for her to not only overcome the naysayers' view points of how she (or anyone for that matter) could become an artist, but also learning to embrace the budding artist in us all. From her grade school years, to the world wide web, to some of her mentors and literary influences, Gayle covers the gamut to let her readers know that you are not alone........and you can do it! I feel special, she was sweet enough to sign my copy when I got it from her web site! Your mind will be spinning with ideas when you're done reading! I found this book to be awe-inspiring; I just couldn't put it down. I think anyone who follows Gayle's advice on how to make it as an artist will have no problem becoming one. Thinking Outside the Frame takes you through a journey of struggles and triumphs and shows that you are an ARTIST.